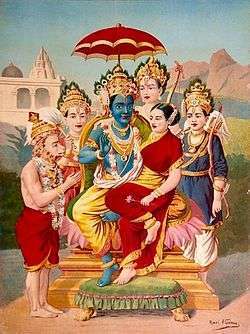 Narantaka (Narāntaka) (or Narāntak) and Devanataka (Devāntaka) are demons who appear in a number of Hindu legends. In the Ganesha Purana, they were a son of the rishi Rudraketu. (In Satya Yuga) After praying to the god Shiva, they were granted boons and become powerful and cruel rulers. They assume sovereignty over svarga. In response Ganesha, a popular elephant-headed god in Hinduism, turns into an Avatar named Mahotkata. He battles the Demon army with help of the Ashta Siddhi. Eventually Mahotkata manages to kill Devantaka with one of his tusks. In the epic Ramayan (which happened in Treta Yuga), they are the rakshasa (demon) sons of the evil demon king Ravana. Narantaka was in charge of an army consisting of seventy-two crore (720 million) rakshas. He with his army were eventually killed by the vanara Dadhibal [Son of Sugreev]. 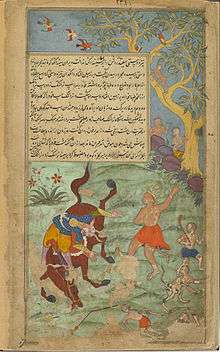 Devantaka is killed by Hanuman during a war.